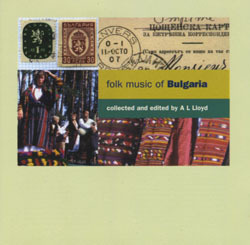 Lying between Europe and Asia, Bulgaria displays in its traditional music both the formal solidity of the West and the exotic colouring of the East. These recordings, mostly collected by A.L. Lloyd on trips in 1954 and 1963, are very diverse, including instrumental solos on the stringed tambura, dyudyuk (flute) and gadulka (fiddle), band music and songs for various functions. Especially captivating is the women’s singing, whether solo or in group polyphony.